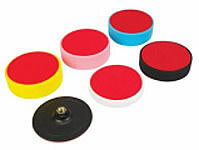 Most of Glass Technics abrasive and polishing pads are supplied hook and loop (velcro) or M14 where shown. The flexible weave allows water and air to pass freely, making the product suitable for both dry and wet sanding, either by machine or hand. Mirka Abralon and Abranet in other sizes eg 150mm and types are also available. A mesh pad which helps prevent excess heat build up. This sanding material contains thousands of small holes, making it possible to effectively sand without clogging the disc surface. The result is seen as a very uniform sanding pattern and a perfectly smooth surface. A foam layer which is placed between the polisher backing pad and the abrasive disc to create a very soft sanding surface, which will help alleviate swirl marks etc.